Gordon Shedden took a step closer towards clinching a second Dunlop MSA British Touring Car Championship crown with a superb performance at Silverstone, as Matt Neal celebrated his 25th anniversary in the series with a hat-trick of strong finishes. 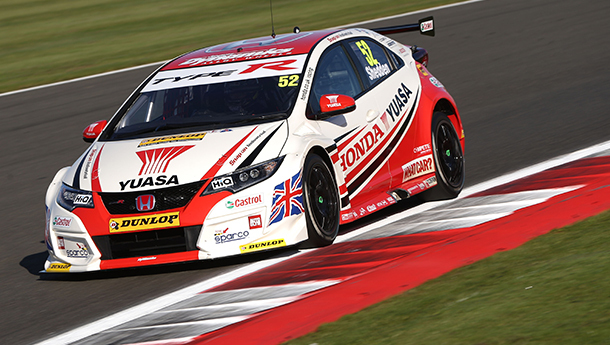 From second on the grid, championship leader Shedden made light of the maximum success ballast aboard his Honda Yuasa Racing Civic Type R by battling to a rostrum finish in third position in race one - in front of all his principal title rivals. On the softer-compound rubber in race two, the Scot produced a consistent drive to take the chequered flag fourth - again the best-placed of the championship-challenging quintet - and he concluded proceedings with fifth spot in the finale, chasing Jason Plato throughout but remaining mindful to stay out of trouble with so much at stake. Having been stymied by traffic in qualifying, Neal fought his way through to secure eighth in the opener - just two seconds adrift of the sister Civic Type R - before shadowing his team-mate across the finish line in fifth place in race two and playing a similar rear-gunner role in race three en route to sixth. The results mean 2012 BTCC Champion Shedden has increased his advantage at the top of the standings from six points to 23 with only one race meeting remaining. Neal is still well in touch in fourth, as Honda pulled further clear in the manufacturers' contest. "It's great to come away with such a good points haul from a circuit that we anticipated was going to be difficult for us because it traditionally has been in recent years," reflected 'Flash'. "Arriving at Silverstone, our aim was damage limitation and to try to maintain our championship lead, so to actually extend it is a really positive outcome and underlines how hard we've worked on the Type R.
"We laid the foundations in qualifying with a cracking lap, and the car was mega in all three races. It was good to get the podium in the first one, and in race two we concentrated on managing everything with the weight on-board and soft tyres. In the last one, I was trying really hard to find a way past Jason, but at the same time I knew I had to keep an eye on the bigger picture. "We've seen time and again that this championship can turn on its head in barely the blink of an eye, so we'll just go to Brands Hatch, give it our best shot and see what happens." "It was a very solid weekend that exceeded our expectations," echoed Neal. "We thought we were going to be in for a pretty tough time here and it's been completely the opposite. "We turned the tables on the opposition and really took the fight to them, which was night-and-day compared to previous years at Silverstone. That shocked us a bit, and I think it definitely shocked them! They thought they would be breathing down our necks going to Brands Hatch, but as it is, we've pulled further away. "We had strong pace in all three races and the car felt fantastic throughout. It was a little bit of a shame about qualifying - the slipstream effect is so important round here and when it's this close, you're looking for literally fractions of a second - and being so difficult to overtake, that probably prevented an even better set of results. Still, we scored good manufacturers' points again and now we go to Brands Hatch fully focused on finishing the job off."